SWM has further moved into Northern Andaman Sea. Cross Equatorial Flow has picked up considerably in the Bay and Arabian Sea. Winds over 40 knts are seen gushing Northwards off the Somali Coast, and upto 40 knts winds, rushing towards NE, are also seen in the Bay. Today's SST map is reproduced here to show the Sea temperature falling sufficiently along the Somali coast. It is presently around 18/20c. Now, this difference with the Central Arabian Sea plays a key role in cloud formations off the Western Coastline of India in the Central Arabian Seas. The SST along the Somali coast will rapidly fall to around 17c/18c in the next 10 days. But the current drop is sufficient to help form Monsoon clouds around the Maldives. Cloud formation off Kerala is gathering, and in next 24 hrs, wind speed along the Sri Lanka coast is estimated at 40knts (in gusts). A slight fall is seen in the Bay waters SST. The Seasonal Low seems to have strengthened. We see today's pressure at 996 mb. Getting gradually ready enough to create a gradient to pull up SW winds into the mainland. The day temperatures on the Sub-Continent Northern plains are on the normal side from this week with the average the day's highs are around 40c. Currently the days have dropped to 5-7c below normal in North India...This is due to back to back Wds...M-4 and M-5. Across in Pakistan' Sindh region, the core area for the formation of the low, the highest has already crossed 50c in Mid May. WDs should slow down now, as the jet streams at 200 hpa are re-grouping fast into position. 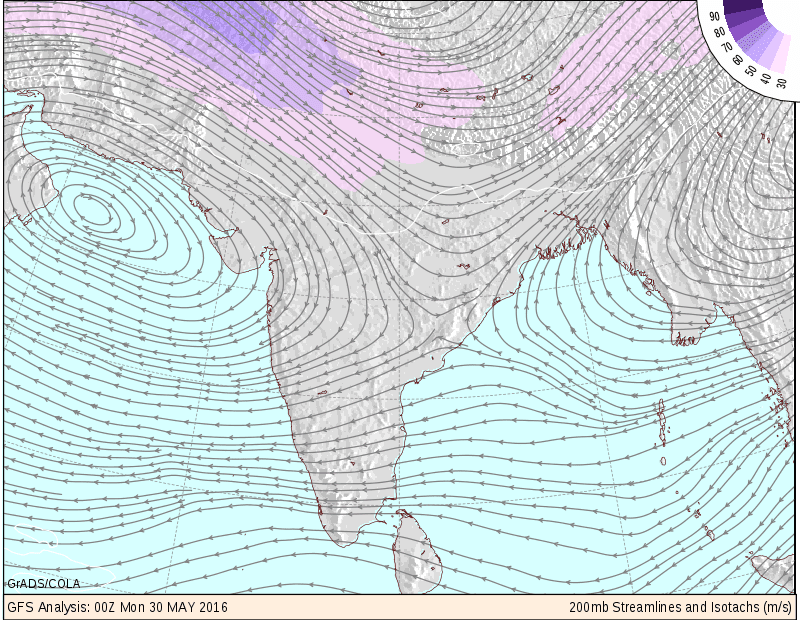 The Jet Stream Easterlies are almost upto the 19N line, and the "High" formation is taking shape in Arabian Sea. This Anti Cyclone will move Eastwards...Expected placement of this "High" should be inland towards Chattisgarh for perfect position. The Bay sector SWM has been stagnant, and not picking up as expected from a "setting in" Monsoon. In the next 3/4 days, SWM, could advance further into the Bay. Changes in 850 hpa winds (anomaly) show a reviewed MJO pattern. Weak in our seas till mid June..and thereafter going back to neutral as the wave moves Eastwards. -Possibly into Coastal Karnataka. S.I. Karnatak, and TN regions by the 8th/9th of June. -SWM advance in to NE states by first week of June. Keep Checking Monsoon Advance Position in vagaries. Further Advance into Central, Northern India and Pakistan will follow. (This Monsoon chase is my personal view, and my personal analysis and deciphering is done as per my assumptions. Should not be used for commercial purposes). Well done sir :) sir dont u concider himaliyan/tibetan heat? Is it above normal or normal? The high over arb at upper level jet stream will move eastwards do the bob lows steer below this high? I mean this high can indicate the futurr steering of bob lows? Meticulous work.... great to be a reader of VOW for such a wonderful work getting shared by you. Over the years, I have seen whenever monsoon gets delayed the rainfall activity in bangalore-mysore-hassan-anantput-chitoor-dharmapuri-krishnagiri goes on overdrive. So slight delay is good for us. But long delay is bad for everyone. 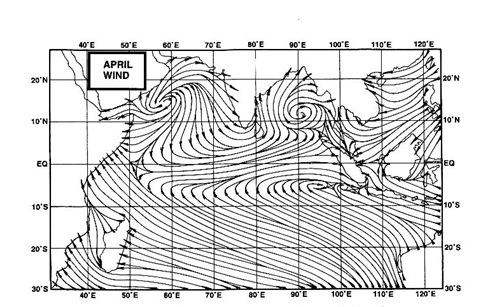 Any chance of cyclone in cental arabian sea during onset..if cyclone form during onset it will be very harsh. Rajesh sir condition is looking very bleak for west coast onset.ur view on that. Rajesh sir,the gfs model is predicting big cluster of clouds near mumbai between june9-11.will it affect konkan,mumbai coast? abizer: The models generally show a rain patch, or rain region, not normally cloud clusters. Rain patch around Mumbai is the pre monsoon thunder showers around 9th. Moshin: Once the off shore trough forms off the west coast, things will not look bleak. As i said, thunder showers and pre monsoon rains start along west coast soon. See dates given in this article. We may see an UAC or even a Low embedded in the trough, which may appear around the 8th of June. This will increase rain intensity, and pull Monsoon up along coast upto Saurahtra coast and parts of inland Saurashtra after 10th June. Zohair: I normally consider Tibetan conditions (Like SE thunderstorms etc) before the Monsoon in April, and later the conditions after the Monsoon sets in and axis is over our region. The High presuure at 200 hpa , as you correctly said, will guide and steer the course of depressions and deep depressions later. If the High (STR) is over the Northern Bay, then system move NE into Bangladesh or Myanmar. We may see an UAC or even a Low embedded in the trough, which may appear around the 8th of June. This will increase rain intensity, and pull Monsoon up along coast upto Saurahtra coast and parts of inland Saurashtra after 10th June. This is not definite. So sir, early chances of monsoon over Gujarat cost. 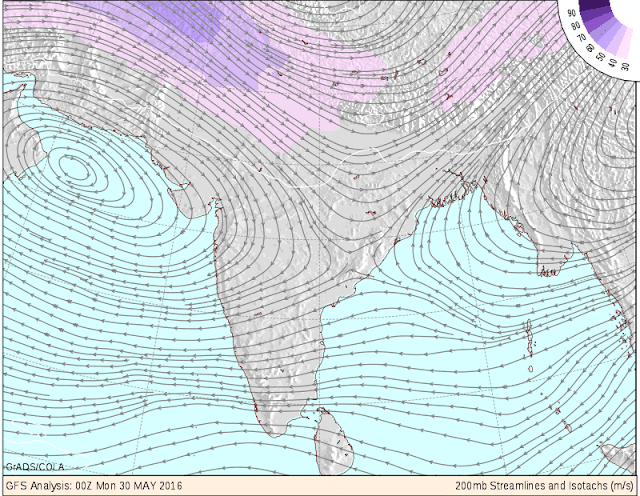 Sir, you mentioned about proper position of anticyclone/ high over chhattisgarh. Please clarify the things, as i didnot get it. Nilesh: The "ideal" position ( in Monsoon months) for the Sub tropical Ridge (STR) that is the anticyclone in upper winds, would be over Chattisgarh. This would facilitate any system, coming in Monsoon months , from the Bay to track west inland. Would bring good rains to central India thru to Gujarat and Sindh. The STR normally shifts East -west, and Eastwards shift would make any system in monsoon track NE. farooq: we have to see if the Low forms in the Arabian Sea trough. Only trough will not bring rains to Hyd Sindh. If Low forms, then we follow its path.